In Australia, except in Western Australia, sport has become highly dependant on gaming machines (also known as "pokies" or "slot machines". The statistics on how much money is gambled at clubs in Australia is staggering. An article in the Sydney Morning Herald titled "Clubs hitting the jackpot and keeping most of the booty" on 16 April 2011 stated that Penrith Panthers (a club supporting a Rugby League Team in New South Wales) earned $91million from its poker machines. to provide for an on-going reduction in the number of gaming machines in the State by means of the tradeable gaming machine entitlement scheme. Every gaming machine must display both a gambling warning notice and a problem gambling notice that offers counselling. Make available "self-exclusion schemes" i.e. patrons can, if they so wish, ask to be excluded from nominated areas of a gaming venue or the entire venue. 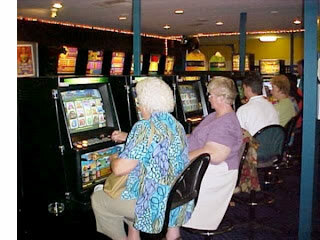 Any person playing a gaming machines must be able to see a clock at all times. Clubs must not offer free credits to play gaming machines. Whilst a few very large sport clubs benefit very greatly by operating gaming machines, the vast majority of sport clubs in Australia do not have suitable premises or sufficient capability to run the type of business operation needed. In fact, large numbers of club have tried and have gone into administration. State governments in Australia now impose a cap on the number of machines. This means that a club can only take up new machines if other clubs sell their machines. There has been considerable debate about the damage caused by gaming machines in Australia. The industry claims that problem gamblers making up only a tiny proportion of the patronage. However, anyone who is capable of doing simple maths can see that there is a major problem. This is particularly so when crimes relating to gambling debts is prevalent. UnitingCare Australia commissioned a study that was undertaken by Monash University into the level of poker machine losses. The study revealed that the population in south western Sydney were losing 10% of median income in the best areas and 30% of median income in the more socially disadvantaged areas.